Yes, it's that time again ... time to step back a couple of hundred years, and for a few minutes at least, put aside the modern world and spend some time living in the past. Our 'guest' craftsman this issue is the man who made my 'baren', the tool I use for pressing the paper onto the woodblocks. He is one of only a couple of men still doing this work, and I feel quite lucky to have got to know him. I had a bit of trouble trying to take a picture of his workshop, and eventually had to give up. His room is about two tatami mats in size and jammed with printmaking materials. Sitting on his cushion gives one the same general impression as sitting in one of those early day space capsules. No matter which way I pointed the camera, everything was too close to get in focus! I hope my words will suffice to give an adequate image of his work. We'll also have a bit more in the 'how it's done' department, a report on my overseas demonstrations last year, and the regular features. I had a few problems when it came time to start doing the 'paste-up' for this issue. There was no way I could get everything to fit into place on the layout paper, and I realized that over the past couple of issues, I have been trying to fit in more and more stuff each time. This is not good. I have eight more years to go, and there is certainly no need to introduce you to everybody and everything all at once! When it comes time to start putting the next issue together (tomorrow morning! ), I'll try and relax a bit, and make an attempt to be less wordy. Can anybody recommend a good English teacher? Finishing the Tenji Tenno print took me a full year. Why so long? At the time I started carving it, I had been in Japan a year and a half. When we arrived in the summer of 1986, I eagerly jumped into printmaking work, making 3 or 4 prints in the first few months. 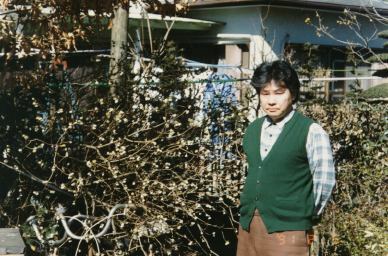 To support my family, I started an English conversation school in our home in Hamura. The original intention was to teach 'just enough' to get by ... and to devote most of my time to printmaking. As I learned quite quickly though, life in Tokyo can be expensive! The initial deposit and key money of our apartment had pretty well wiped out our small cushion of savings, and I had to take in quite a few students before I could earn enough to balance our budget. 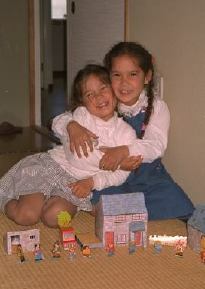 During this first year, I also ended up getting into the toy business. As we came to Japan almost completely empty-handed, and my two children had nothing to play with, I made a number of wooden toys and puzzles for them, and our Japanese neighbours and friends found these very interesting, being quite different from the commercial plastic toys they were used to. I started to get requests to make some for sale, and this gradually expanded, taking up a great deal of time. Through 1988 these three activities, English teaching, toymaking, and printmaking, all jostled for my time. 18 English classes per week (plus extensive preparation time), orders for hand-made toys (very labour-intensive), and requests from my wife to assist her with her medical translation work, all combined to absorb most of my energies. Printmaking simply had to take a back seat. Paying the rent was more important. All these activities were enjoyable, but together they were just too much ... and what was worse, it was like being on a treadmill, there was no end in sight. My original intention of studying printmaking was growing fainter and fainter. In September of that year, I had a day of decision with myself. I knew that English would have to stay to pay our basic expenses, but which of the others should be my next career? I listed all the pluses and minuses for each activity. There were many points, but the determining factor was probably portability. Toymaking would need a large workshop, many tools, and complicated retail distribution. Printmaking, however, could be done in a small room, could be easily relocated, and could be done (I hoped) on a direct basis between myself and the collectors. I made the decision, and regretfully shut down my toy business (I still have a few left-over puzzles and toys in the closet). The teaching still took up most of the time, but I promised myself that at least one day each week would be totally devoted to finishing this print, with no distraction permitted. It worked. My family cooperated, and the carving on Tenji Tenno was finished a few months later, during the New Year holiday from teaching. Most Japanese people are aware that large numbers of the famous Ukiyo-e prints of the past now reside in foreign museums and collections. Collectors from the west were quick to appreciate the artistic value of the prints, values often overlooked by the Japanese of that time. It should thus come as no surprise to anybody to find that of the collectors of my prints about one third are non-Japanese. 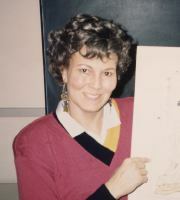 In late January of 1990 English-speakers had a chance to learn about my work in a short piece in the Japan Times, and among the phone calls that came in was one from Rebecca Marck, who was then working as a high school english teacher in Nagano Prefecture. She soon became an enthusiastic collector of my prints, and recently I had a chance to get to know a bit about her when she visited Tokyo on a weekend trip and dropped by my exhibition in Ome City. I think that for her, being part of this Hyaku-nin Isshu project means being part of something much wider. She spoke to me about the continuity that exists from those long-dead poets right down to those present day youngsters who study their works. The poems and the accompanying cultural background have been preserved and re-interpreted continuously now for centuries on end. She intends to be an active part of that tradition, helping to make sure that the chain is not broken, and that this important cultural heritage is not tossed aside by a new generation that sometimes does not seem to care too much for such things. She brought a small gift from Nagano when she visited the exhibition, and the bouquet of those fresh Shinshu apples, which were shared among the gallery guests, remained after she had left that day, as the memory of those shared experiences will remain with her students and friends in Japan, and as the prints that she has helped come into being will remain as a legacy for future generations. Becky-san, for your support of my work, and your words of encouragement, thank you very much. I was starting to get a bit frustrated. Perhaps I would not be able to live up to the boast I had made on the telephone, "Of course I'll be able to find your house, don't worry ...." From my home in Hamura to Shimo-fujisawa in Saitama had taken just one hour by bicycle, and it had seemed that there was going to be no problem. But I had now been wandering around the town in ever increasing frustration trying to locate the house, and in my fear of being late I was ready to swallow my pride and ask directions. I pointed my bicycle down a narrow path where a woman was sweeping leaves, and hesitantly asked her, "Sumimasen, Shimo-fujisawa no yon hyaku hachi wa doko ni arimasu ka?" Of course, that turned out to be her house number, and this was my destination. It had taken me a hour to get to their town, and another hour just to find their house. I was visiting Mr. Kikuo Gosho to see something of his work, and to place an order for one of his hand-made barens, the tool used for rubbing the printing paper over the woodblocks. Up to this point I had been using a varied selection of barens, mostly student-grade tools that I had obtained from art supply stores. Some of these had been quite expensive - about 15,000 yen, but all were less than adequate, and I was growing increasingly frustrated with using them. There is a well-known saying to the effect that it is a poor workman who blames his tools for bad work, but nonetheless, you don't see many professionals using toy tools. Some professional printmakers had recommended I come and see Gosho-san. This visit was long overdue. The house is small, and there is no room for a special workshop. Gosho-san's work is inseparable from his family life. 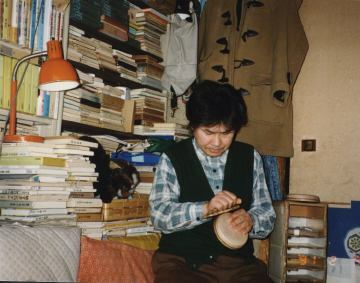 He works on the floor in the center of a six mat room, flanked by his two children's school desks, towering bookshelves, and the usual assortment of Japanese wardrobes. As I enter the house, and walk sideways down a narrow passage, I can see that every inch of space off to each side is jammed with his vast collection of materials related to printmaking: books, tools and prints. He obviously lives for 'hanga'. His work just as conveniently can be summed up with one word: 'take', the Japanese bamboo (pronounced like the drink: 'sake'), for it is this versatile plant which provides the material necessary for making his barens. A printmaker's baren has three main components, a tight coil made of literally thousands of short thin strips peeled from the outer surface of a special type of bamboo leaf; a backing disk made of dozens of layers of tissue-thin Japanese 'washi', pasted together over nearly a month at the snail's pace of one sheet per day; and finally the covering, a specially prepared, tightly wrapped leaf from yet another kind of bamboo. This 'formula' was developed gradually over a period of some centuries, and has proved to be so well matched to the printmaker's needs that no substitutes have ever been able to replace it. Modern Japanese entrepreneurs have tried dozens of alternatives: molded plastic, rows of tiny metal balls mounted in teflon, and many other ingeneous devices. None of them do the job as well as the traditional materials. Bamboo remains 'king'. But back to Gosho-san, working on a customer's order. The preparation has been done, the thousands of tiny bamboo strips needed to make the coil all sliced to size and carefully moistened. 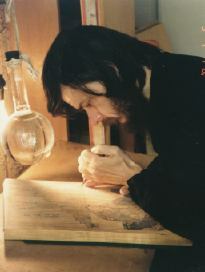 He sits in front of a low wooden frame and starts lacing the strips together, four at a time. The first ones are tied to a loop on the frame, and then a lightning fast twist, twist, twist, produces the first few centimeters of delicate woven bamboo 'rope'. As the strips in his hand become shorter, new ones are fed into the work. His hands are a literal blur, and I can't possibly see what he is doing. I try counting how many fingers would be needed just to simply hold the growing rope and the clutch of thin strips. I give up at 12. A typical baren will contain 18 meters of this delicate creation, with some using much more. It will take him many, many hours to produce the necessary length. His fingers are covered with areas of tough hard skin at the points where he rolls the strips into tight spirals. Work on the backing disc takes place simultaneously. 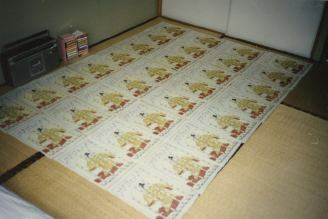 Each day, a filmy sheet of washi is added to those glued onto a carved template on previous days. 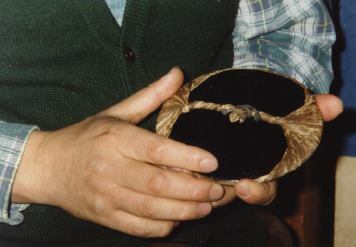 When the required number are in place, a covering layer of silk is pasted over the stack, and this is topped with rich black Japanese lacquer, a finish just like that which we see on expensive laquerware. This month, he will make a total of six of these beautiful tools, each of which will go to a highly appreciative customer, who will treasure it for a lifetime. After some discussion of size, and details like the number of windings in the coil, I place an order for him to make me one. The price will be 50,000 yen, which although it sounds expensive, is actually a bargain considering the amount of work I will be able to do with this tool over the coming years. He promises that it will be ready in about six weeks, and I make my way home, a little more directly than I came. His phone call finally comes (I had been sleeping by the telephone! ), and Michiyo and I cycle over to pick up the finished baren. After nine years of struggling with poor tools - I have never felt anything like it. This is the way to really feel appreciation for a good tool: to go through a training period with 'average' equipment, and only when you have developed some feeling for 'how it's done', to step up and receive at last your 'real' tool. This baren will be my partner for many years to come. All the prints you have been receiving from me this past year have been printed by Gosho san's handiwork. The professional printers I visit occasionally in Tokyo all have quite a collection of barens, thin ones, thick ones, with heavy or light coils, etc. They reach for the one that best suits the particular job at hand. In the future (near, I hope), when my skills have developed somewhat further (and when my budget allows), I will be back here once more, to watch Gosho san's flying fingers weave some more of his magic bamboo rope. If smooth deep colours are finally becoming apparent in my prints, it is in large part due to the hours he spends crouching over his work, endlessly twisting, twisting, twisting, those little pieces of the amazing bamboo. Gosho san, for your hard work and dedication, thank you very much. In the Fall issue last year, I discussed the procedure for getting the basic black lines of the image onto the woodblock ready for carving. Of course, I also need woodblocks for printing the coloured portions of each print. How are they prepared? Nothing can be done about any colour blocks until all the carving on the black block ('key' block) is finished. In much modern printmaking, black may be simply another colour, not treated any differently from the others, but in Ukiyo-e work, the black lines provide the foundation on which all else is built. Just for fun, I keep a set of my prints handy in my workshop which have not been printed with any colours, and I find these just as attractive as the 'real' versions. In fact on these prints, the eye is not distracted by any colour, and the living, fluid sumi ink lines flow freely across the page. When the black block is finished, I clean off the last bits of the paper that carried the design, and then print some 'transfer' copies of the image. These are made on very thin paper, very similar to that which I used for the black outline block. I make as many of these copies as there will be colours in the finished print. On each one of these sheets (which show the black lines only), I carefully mark in the areas that will be needed for a particular colour. For example, if there is to be a skin tone, I take one sheet and highlight the face, hands and feet. On another sheet, I highlight the kimono area, and so on. Each colour gets its own sheet. In the old days they used a vermillion ink to do this, but I use a 'fluorescent highlighter' (it wrinkes the paper less). When they are all done, I check for errors, and then carefully paste each sheet face down on a blank woodblock. I then carve these according to the markings, resulting in a complete collection of blocks for all the colours in the final print. If I have done my work carefully, the carved areas on the colour blocks match the corresponding areas on the black block exactly. Sometimes all goes well, and no kento adjustments are needed. This is rare. It is much more typical (even for very experienced printers) to be making constant adjustments to the kento as one proceeds. One has to inspect every sheet as it comes off the block for every colour, in order to catch and correct the changes as they occur. It can be a frustrating process. If you look back at that previous newsletter (Fall 1990) to the photograph of an original print on page 6, you can see where the colour block for the 'tail' of the hat became misaligned by about a millimeter. The printer presumably made the necessary adjustment before printing the next sheet in the pile (at least, I hope he did!). It's difficult work, but fun, and this printmaking is certainly having an effect on my character, training me to be methodical, careful, and above all else, patient. I'm sure my parents will get a good laugh when they read that! Late last year was a very interesting time for me, my first trip out of Japan in nearly five years. 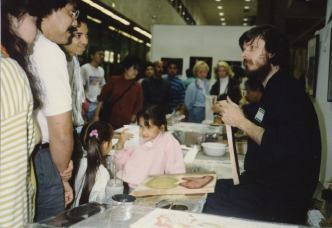 For three days in November I was busy demonstrating the woodblock printing process as part of JAPAN EXPO '90, a large event held in Los Angeles every year. There were about 80,000 visitors to this year's exhibition, and I think that I talked to all of them! I was one of a group of six craftsmen invited from Japan: a doll maker, a spinning top maker, two paper makers, and two printmakers. The exhibition covered the complete range of things Japanese, from giant corporations like Toyota and Yamaha, right on down to .... well, right on down to woodblock printmaking! Mr. Kenji Seki, the other printmaker, and I worked our way through a large stack of printing paper over the course of the show, and hopefully were successful at giving everybody at least a bit of an idea of how the prints are made. Of course, most viewers were content with simply watching for a few minutes and then wandering on, but a surprising number of people wanted to have me outline in considerable detail many aspects of what I was doing. Mr. Seki and I made a good combination: he gave them the 'authentic' appearance that they expected, while I was able to explain what we were doing in the language that they understood. Here at home in my own workshop I'm getting quite used to sitting crosslegged at my workbenches for hours at a time, but the LA show left my knees aching like a beginner - 10 hours straight for three days running. It was fun, but I was glad when it was over and we could head out and do some sightseeing. A few days later, we headed north by Amtrak to Seattle and Vancouver, a very enjoyable two day trip. The train was very comfortable, a peaceful ride through beautiful scenery, and left me wishing that it was possible to make the return trip to Japan by rail! The events in Vancouver were on a much smaller scale, a private party in an art gallery one evening, followed by a day-long demonstration. One very interesting aspect of the trip to North America was the number of people I met who asked, 'Where can I learn about this?' When I do some kind of demonstration in Japan people are interested in watching; in America they want to do it. I am sure that one day, if this form of printmaking ever dies out in Japan, it will be kept alive by enthusiasts in other parts of the world. Of course, not all the people who want to try it will end up becoming skilled craftsmen, but we will never be able to keep the craft going unless there is a wide general interest. To that end, I will continue to 'go public' as often as I can, and try and encourage and assist anybody who wants to get involved. Anybody out there looking for a new hobby? As I have an extra page to fill, I guess it's time to introduce my three live-in helpers! 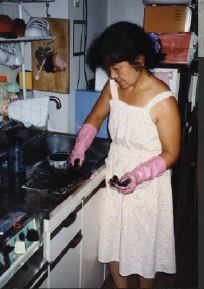 Michiyo has three official jobs: translating this newsletter, 'cooking up' the printing paste, and twice a year or so, blending the ink sticks for printing the black outlines. Himi-chan and Fumi-chan don't have any particular duties .. yet! At the moment they are seven and five years old, and it scares me to think that they will be fifteen and thirteen when this project is done. I've got to remember to look up from my blocks and say 'hello' more often!